When we talked about the trip before we left, all I could think about was the food. And it didn’t disappoint (with the exception of one calzone and the pâté that I just couldn’t force myself to like). We were blessed by so much more than the food though. But, food is where we will begin. 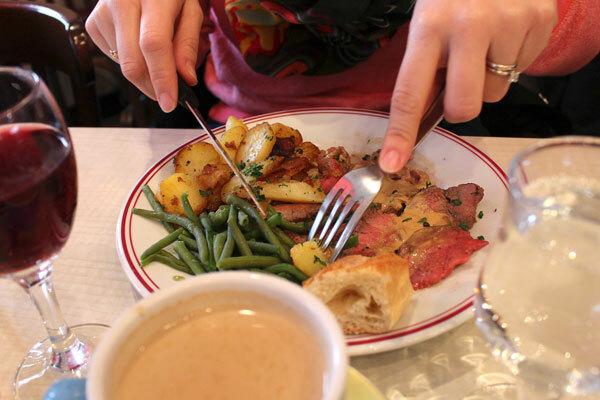 We spent three weeks in Paris and in that time, I cooked dinner just once. I’ll admit, as much as I love to cook, it was really nice to have a break. So we ate out a lot. I won’t bore you with every detail of every single meal (you’re welcome). But, here are a few highlights. We ate baguettes every day. They might be what I miss the most about Paris. Not joking. I have refused to eat “French bread” since we’ve been home. It is not the same. I was given a kitchen scale for Christmas so I can finally try to make my own baguettes. Wish me luck! They’re harder to make than I’d expected (more about that in the Cooking Classes post). We ate a lot of butter. (We also walked about 3-5 miles a day…) Amazing, salted, European butter. 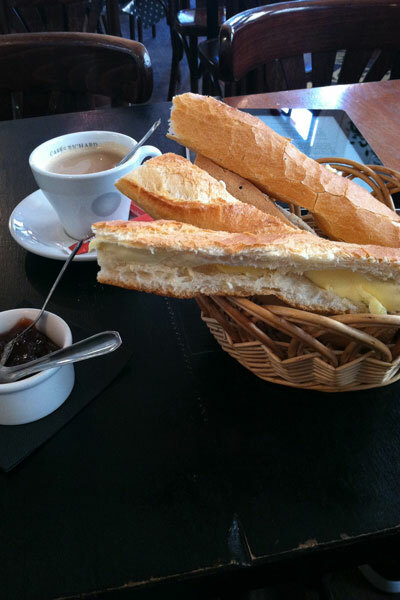 The best butter is obligatory when eating a French baguette. 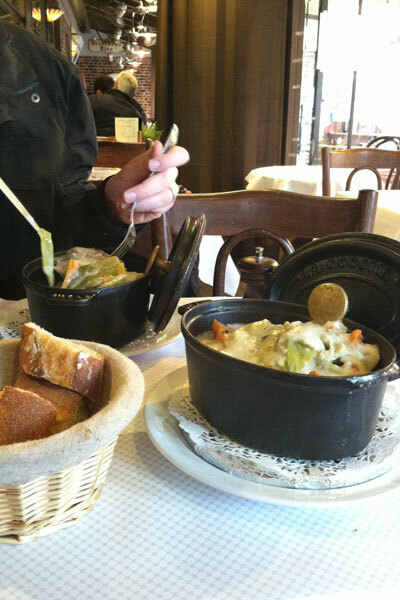 Our first meal in Paris was at La Chope. 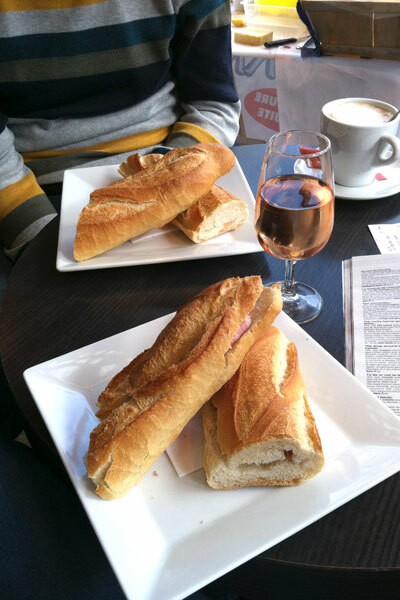 We ordered ham sandwiches and got a baguette with butter and ham. Not what I’d expected. It was better. The sandwiches were simple and delicious. I had mine with my first glass of lunchtime wine, a rosé. We ate (trying to convince ourselves that we weren’t exhausted), watching people through the window. There was a man selling oysters in front of the café. People would walk up and get a sample. Most bought some too. It felt like everyone had a baguette in their bag. I knew we’d come to the right place (because of the baguettes, not the oysters… not my favorite). We ate a so many little cafés that I’ve lost track. Most were great, a few were just good, some were more touristy. Our preference was to dine at the ones where we felt a little out of place, but got along just fine. (Note: We didn’t experience any of the “French rudeness” that people talk about. I speak French, but Tim doesn’t. However, he tried. The server would come over to take our order and Tim would ask me how to say something, I’d translate it, and he’d repeat it to the server. All the while the server knew what we were both saying, but waited patiently for Tim to finish. My French was corrected and also complimented. We thought the French were incredibly kind people.) Our two favorite restaurants were like this and we ate surrounded by the locals, enjoying real French food. 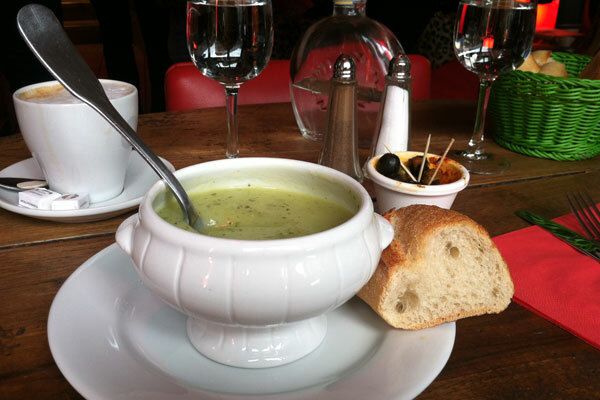 Our favorite favorite favorite experience was at a little bistrot called Au Bon Coin, located at 49 rue des Cloys, Mairie du 18e, Paris, France. We had been in Paris just two days. We were finally getting over our jet lag and feeling a little more normal. We walked a few minutes from our little rented flat and decided to try it for lunch. It was crowded. We found a table at the back and sat down. We waited, sipping water, for menus that never came. I tried to translate the menu that was scrawled on the wall. But, even after taking 12 years of French (a long time ago), there was a lot missing from my vocabulary. 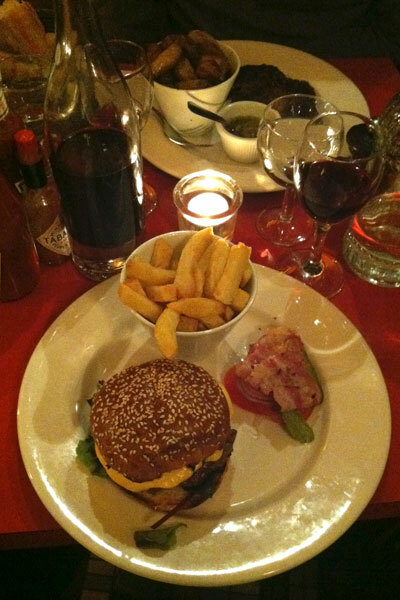 The server came over and we ordered what the guy next to us was eating, with glasses of vin rouge (red wine). 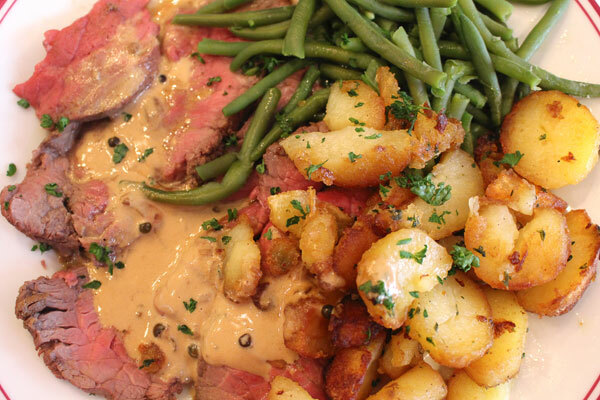 It looked like some sort of beef with potatoes and green beans. Seemed safe enough. It was the best meal (we went back 3 more times and ate the same thing). My goal for 2014 is to attempt to duplicate it. They may have other things on their menu, but I don’t care. I only want this. (Tim tried the Boeuf Bourguignon once. It was good too.) The beef was pink, pretty rare, but so tender and delicious. The potatoes were exactly as amazing as they’d looked. Crispy and so piping hot that I burned my mouth in my need to eat them all as quickly as possible. I need to have them in my life on a regular basis. 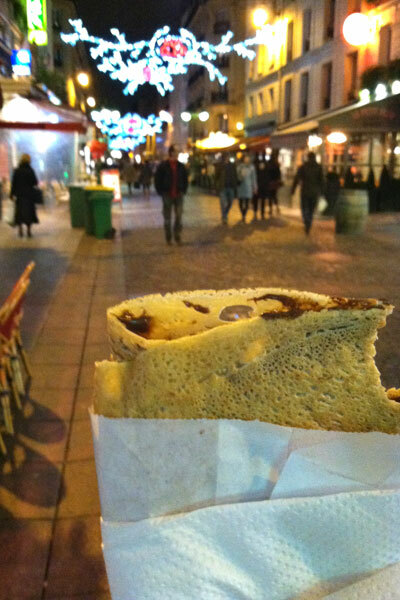 (They might be the thing, food-wise, that I miss the second most about Paris.) The green beans weren’t the star, but they were good enough. I guess you need something to bring the meal back down to earth. But, the food wasn’t the only reason we loved that meal. The man sitting next to us started talking to us. Eventually ending up at our table (we were at a table for 4 – note, don’t do this if you are only 2, and want to continue your meal just the two of you, they will seat someone beside you). The server said (in French), “Don’t worry. He’s nice.” and plopped his plate down next to Tim. So we continued our conversation, noticing that the older woman, who’d come in with her dog, was paying attention to us. She joined in on the conversation. I think we sat there for an hour with them, with me trying desperately to understand them and remember anything that sounded like French to say in response (while silently cursing my lack of motivation during the hours and hours of French classes that I’d taken in school!). Anytime anyone asks us about our favorite experience in Paris, this is what we tell them. 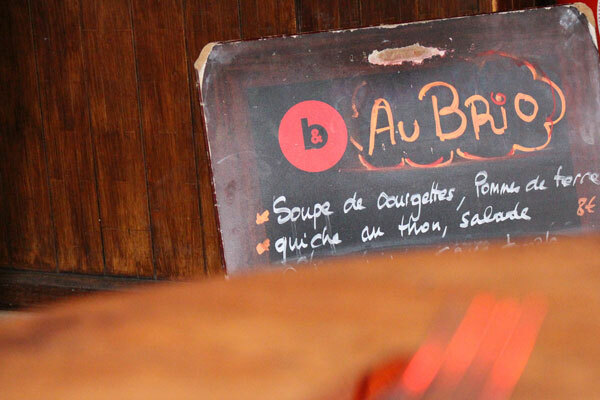 Au Bon Coin is what we consider “our place” in Paris. 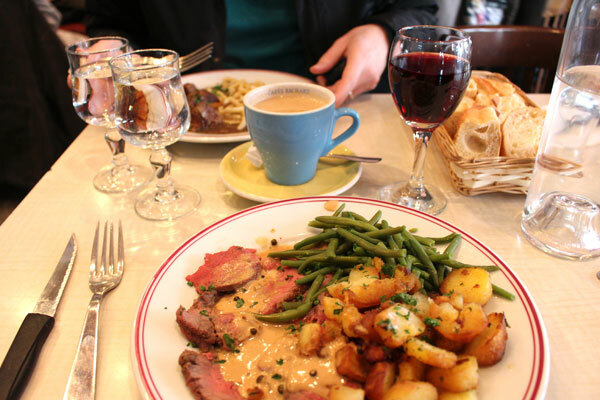 Our second favorite restaurant was another little bistrot‚ just around the corner from home, called Le Brio, located at 216 rue Marcadet, 75018 Paris, France. We made friends here too, this time with the server. A sweet college student who took the time to explain the entire menu to us in English. We ate here a number of times and spent hours at their tables with our books, chatting, watching people, and eating a lot. Our last, including our last evening in Paris we ate here. I tried the croque monsieur and we finished off the evening with some delicious chocolate cake and champagne. This place that we would see every night as we walked home from the metro felt like home. There was another meal that was simply incredible. 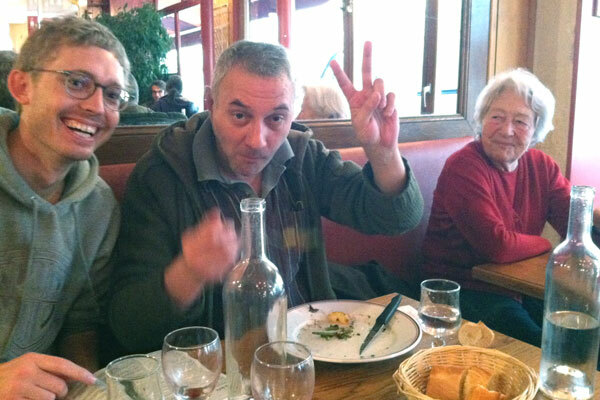 It was at a café by the marché aux puces (flea market) that we went to. 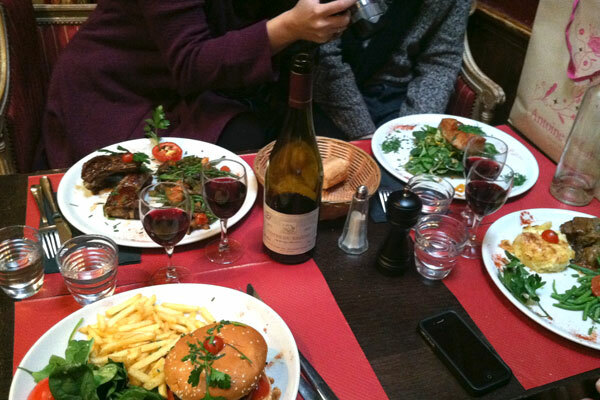 We didn’t have the opportunity to go a second time, but it was one of the best meals that we had in Paris. 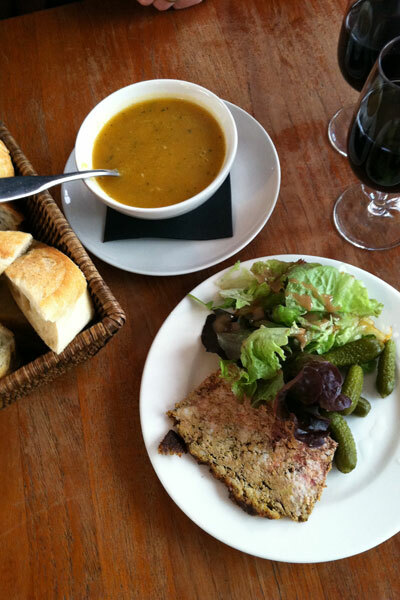 The café is called Café Le Paul Bert and is located at 20, Rue Paul Bert 93400 Saint Ouen, France. 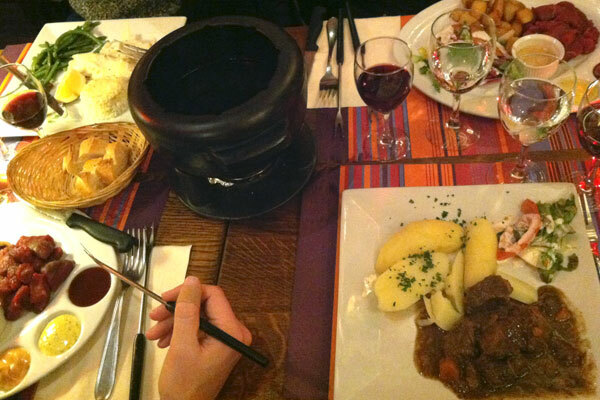 Our entire meal can be seen in that little cast iron pot. It’s chicken with the creamiest, most delicious rice, and the softest carrots imaginable. I need to discover their secret. I may have eaten (almost) the entire serving. You know when something is so good that you really shouldn’t stop even though you know you should? Yeah, that happened here. But, since we would almost always walk again after a meal, I don’t remember feeling overly full. Winner. There were a number of other noteworthy meals and experiences that took place around food. I discovered is that I do not like pâté. 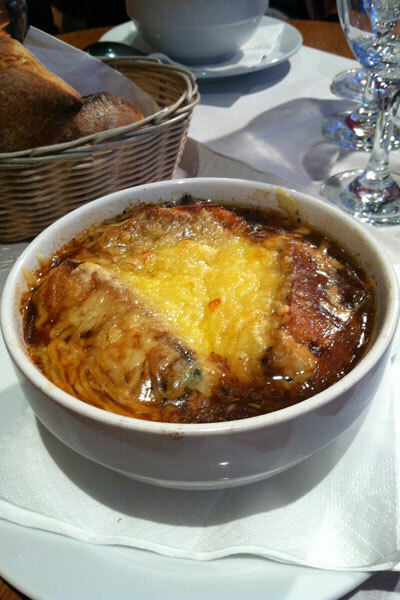 I do, however, never tire of soupe a l’oignon (French onion soup). I can’t remember how many different places we tried it. Some places make it with dehydrated onions, some put the bread and cheese on the side, some make it with so much cheese there’s a huge plomp of it at the bottom of the bowl. Most were good, one or two were great. I think my favorite was at a café next to the Shakespeare and Company bookstore (although I’ll admit I felt a little sick after, maybe because it was so incredibly rich… but it was worth it). 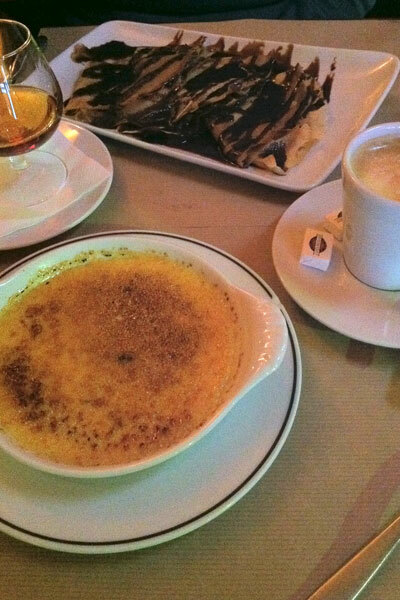 We tried many crème brûlées. They were all surprisingly different from one another. Some thick, some more of a crème anglaise, some with a super crunchy layer of brûléed sugar. You almost can’t go wrong here. We were told that we had to, at some point, try the nutella crèpes. We were wandering around one evening and found a street vender with this simple treat and ate it for dinner as we strolled down Rue Cler. 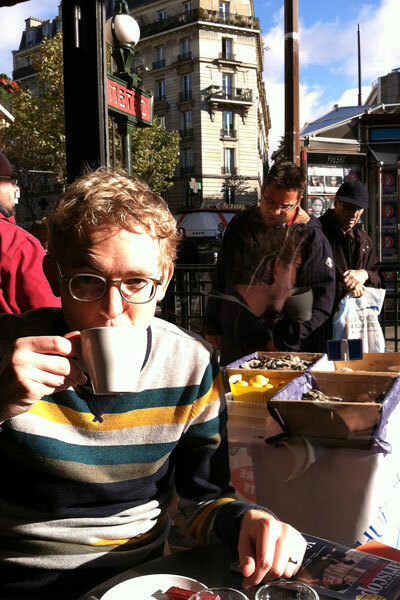 We made coffee at home some mornings and drank it while eating croissants, baguettes with beurre, or pain au chocolate. But, it wasn’t nearly as good as the café‚ crèmes that we drank at the cafés. We never once ordered a regular cup of coffee. I’m not even sure if you can. 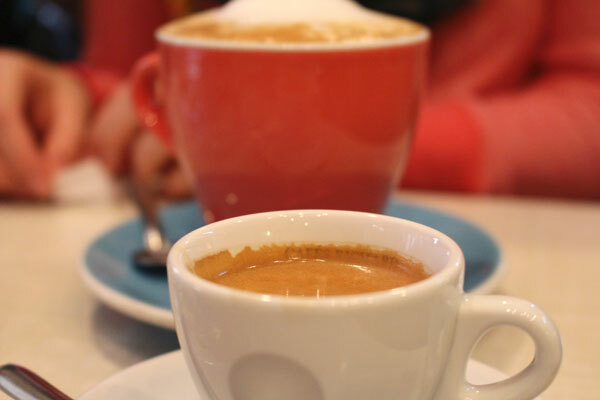 If you order a café, you get a tiny cup of espresso. Who knows. C’est un mystére. I had two burgers in Paris. I’ll admit, I needed a burger and frites. Buuut, they were not from McDonalds. 😉 And, they were very good. In fact, I ate frites quite a few times. The Parisians sure know how to fry a potato. I sometimes have a hard time buying something at a restaurant that I can make at home. Since I have successfully made Julia Child’s Boeuf Bourguignon twice, I have no need to pay someone else to do it. But, that didn’t stop me. I mean, I was in Paris. What’s more Parisian than that (besides baguettes and many other things)?! 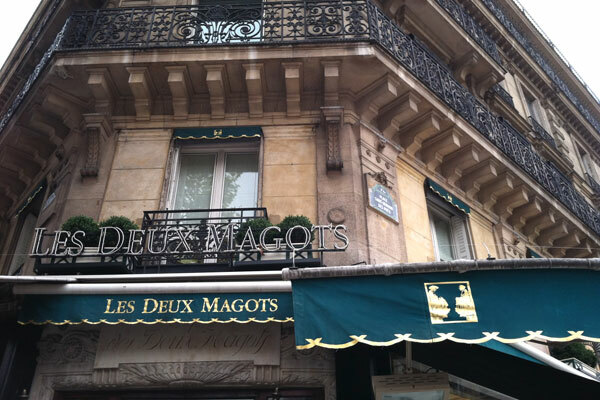 The one place that we didn’t eat that I was really disappointed to miss out on was Les Deux Magots. I’d read about Julia Child eating there in My Life in France and really wanted to eat there too. It was closed for renovations. Sigh. Oh well, guess we will just have to go back. Now that I’m absolutely starving for all the foods I can’t have, I’m going to go make some popcorn for dinner. Baguettes are on my to do list this week. It’s a must. I need some bread and butter. Part two of our Paris adventure will continue next week.